After playing Mario is Missing last week, it got me thinking about other educational games. It’s hard to make an educational game that is actually still fun, but there are a few games that have elevated themselves above the rest. Games like the Carmen Sandiego series still have a decent following, even if in reputation only. Then the Mavis Beacon typing games I think taught me typing better than the teacher did. And who doesn’t love a game of Oregon Trail. Though that last one is more of a “how will my friends die?” game than a learning game. While those games are all great, I thought I’d play one that seemed to be pre-installed on all the computers at my school, Math Blaster. I have always loved the Math Blaster series, partly because it is so much more action oriented than many other educational games. You typically play as Blasternaut, a green alien astronaut with a blaster gun and a jet pack. Each game has you going on an adventure flying around space and shooting up bad guys using math usually to identify your targets. But before I start rambling on about the series, why don’t we just jump into it and start learning some math! Amazingly, the game features a fully voiced introduction. Blasternaut is in his space ship ready to blast off, but he seems to be having trouble and needs to make some repairs. While repairing the ship, his robot companion Spot is kidnapped by the Yellow Three Eyed Trash Alien. Now it’s up to Blasternaut to track down this yellow menace and rescue his friend Spot. The game starts with Blasternaut behind the controls of his ship. All the repairs have been made, but it seems we’re still out of fuel. Luckily, the Trash Alien’s ship left behind a whole load of garbage and that just so happens to be what our ship runs on. But we need to pick the right fuel for the job. To do this, a math problem is displayed on the dashboard. Solve the math problem, and then blast the corresponding piece of garbage to convert it into fuel. The garbage isn’t the only thing floating around out there in space. It seems that Trash Alien wasn’t working alone, and some of his friends might just come by to make Blasternaut’s life difficult. Whenever you see one of their ships in front of you, it would be best to blast them into space dust before they start shooting at you themselves. Fill up the fuel tank, and we can take off after that Trash Alien, but not before one last bonus round. Now, instead of blasting garbage, you seem to be flying directly through an asteroid field blasting away as many space rocks as you can. Thankfully, there’s no danger to your ship since this is only a bonus round. Don’t take too long in the asteroid field, we still have to rescue Spot, remember. Now that this ship is fully fueled, we managed to track the Yellow Three Eyed Trash Alien right back to his home planet. Lucky us, we were even close enough behind him to fly right into his secret base before the door closed behind him. Inside, Blasternaut finds himself trapped in a weird cave full of electrical defense grids. On either side of the openings there is a label with either a number or an equation. If you want to get through the defenses, you’ll have to become a number which falls between the two numbers shown on the labels. But how do you change your number? Well, Blasternaut has to collect drops of water that drip down from the stalactites in the ceiling. Each drop has a number in it that will either be added or subtracted from Blasternaut’s current number. Be careful, because sometimes lava will be dripping down from the ceiling instead of water, and no one wants a face full of lava when they’re expecting some nice refreshing water. The cave is also full of a handful of wild beasts just waiting to tear into our hero. Use your trusty blaster gun to quickly dispose of them before they can cause you any damage. Keep climbing up and up and eventually you’ll make it to the planet’s surface, just in time to catch the Trash Alien. With Blasternaut hot on his tail, the Trash Alien jumps into his ship and tries to escape with Spot. You’ll have to fly right up into the ship to get him back. But how will you know which of the four tubes actually leads into the ship? Simple, just solve the math problem and you’ll know which one leads to saving spot! Knowing which tube is the right one is only half the problem. There’s so much trash flying around on the planet’s surface that you’ll have a tough time even reaching the ship. It’s a good thing you have your trusty blaster to clear some of it away. But the trash isn’t the only thing to worry about as you make your way up into the ship. The Trash Alien will be raining fire down on top of you in a desperate attempt to slow you down. 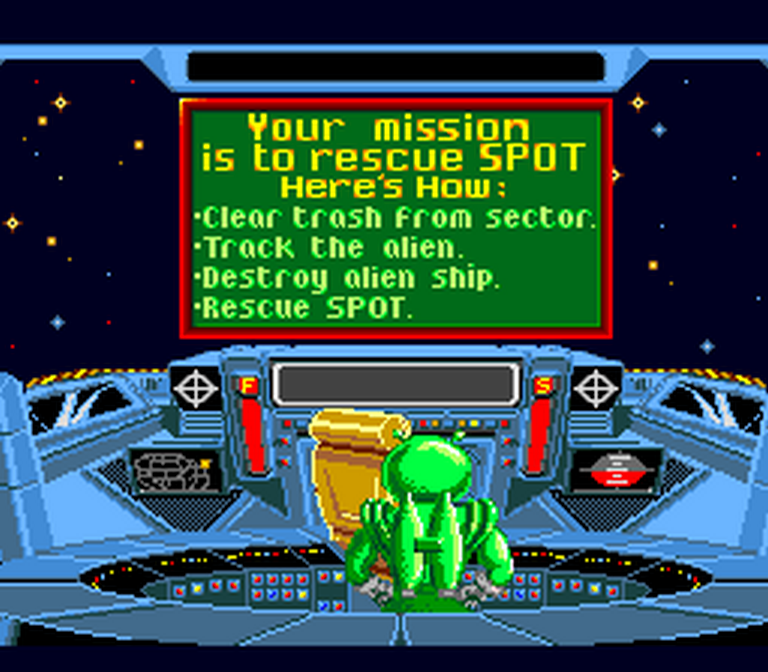 But it will take more than that to stop Blasternaut from rescuing Spot. We’re already traveled all this way and we’re not leaving without him. So with one final push, Blasternaut forces the Yellow Three Eyed Trash Alien to leave his ship and fly off in defeat. Spot is once again safe, and the Trash Alien’s Ship will serve as some lovely celebratory pyrotechnics! I actually really like the gameplay in the Math Blaster Series. It is constantly mixing it up, but always keeps things much more action oriented than most other educational games. It’s not without its flaws though. The first stage in particular becomes slightly frustrating with a controller because it was so obviously meant to be played on the computer with a mouse. This leaves the cross hairs just a little too slow for what you’re trying to do, but just slightly. They actually did a good job programming both the speed and responsiveness of the crosshairs to make it work as best they could with the D-pad. The only other complaint is that Blasternaut is somewhat difficult to control when using his jetpack, he just doesn’t have the right weight to him you would expect. It’s not a very graphically intense game, but everything was handled very well I think. The first stage in particular has a lot of little details that I picked up on. Things like Blasternaut turning the controls alone with you when you’re moving the cross hairs, and his thumb pressing the button every time you fire. Then those asteroids looked almost three dimensional. I’m giving this one a lot of credit simply for that fully voiced introduction. Such a thing on the SNES is practically unheard of. Beyond that, the music and sound effects were quite enjoyable. It did lose a point though because the sound of the score tallying after the stage is rather loud and annoying. It’s a very simple story, your buddy was randomly kidnapped and it’s up to you to save them. However, every section reinforced the idea that you are hot on the trail of the kidnapper. You were actually chasing him the whole way rather than him just sitting at the end waiting for you. It’s a very short game, they knew you couldn’t get kids to sit still much longer than a half hour at a time. But with all the different difficulty settings as well as the fact that so many things are randomly generated, it actually has a lot of replay value. Yes, I died a few times, but this game handles it so wonderfully. You’re not punished and sent all the way back to the beginning like in so many other games. Instead, you just get right back up from where you landed and continue on your adventure as if nothing happened. It’s enough for you to stay aware of what you’re doing, but it’s gentle enough to keep you playing a game you would never tolerate any back tracking from. Making an educational game and having it still be fun is a difficult balancing act, but Math Blaster manages to pull it off. Honestly, it gets so many things right that I can’t even knock it for also being educational. The fast paced, action oriented gameplay keeps you on your toes the whole time. Pair that with good graphics as well as some impressive audio for the time and you are left with a genuinely fun game. The short length is really the only thing I can fault the game on, but with 12 difficulty settings ranging from simple addition right up to double digit multiplication, there is a lot of replay value for a wide range of ages. So if for some reason you’ve never played Math Blaster, why don’t you look past those educational warning labels for once and give it a try. This counts as a high school diploma, right? I hope you enjoyed Math Blaster: Episode One. If you did, like and follow me on Facebook or Twitter. Also leave your comments, suggestions, and recommendations. If you’re feeling real generous, you can even Donate to help me keep the site going. Thank you for reading, and I’ll see you next time.